Hello friends, I hope that you all are enjoying free 4g internet on Jio with Jio happy new year offer.I think all of you already know about the limitations of Jio Happy New Year Offer. After the announcement of Reliance Jio welcome offer and now Jio happy New Year Offer, we noticed crowd running after the craze of getting a sim which provides you with all the free services for three months; be it the voice calling or video calling and even a free 4G data pack with the offer it was actually seen that Jio is covering the market-beating the rest of mobile connection companies to be the fastest growing mobile network as it was promised and simultaneously it grew to be the fear of all other companies. The only disappointment other than huge queues to get the sim was a limited speed of data after 1Gb/4Gb data. With this limitation our tech people started coming up with many ways to bypass the limitation and actually came up with few such tricks. 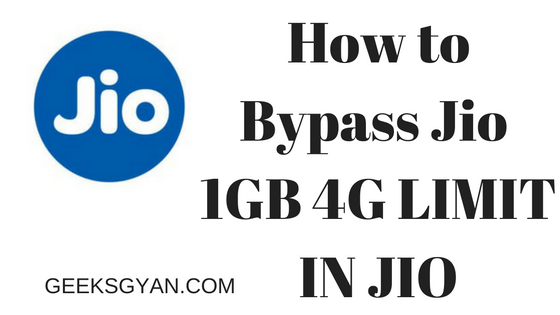 Here, we present you with few tricks to actually bypass the 1GB Data limit on your Jio numbers and keep on enjoying the extended New Year services at your own pace. 1. Uninstall all Jio Apps to download and old version of the My Jio app. 2. Open My Jio app and install all 10 apps. 3.Now wait for it to show an alert "No Internet connection found". With this, now turn on your mobile phone connection and quickly click skip button. Click on Get Jio sim section. Turn on your internet data, skip login (though you will automatically be logged to the app). Get the activated preview offer. 4. These steps brings you to the end of your steps and now you can enjoy the 4g speed easily. To enjoy the 4g speed after crossing the 1gb data in the Welcome offer. 1. Switch off your phone and then restart your phone again . 2. After switching on your phone, start your Jio 4g Data. After, doing these 2 steps you will actually notice the speed of 1GB is back. 1. Open settings in your phone =>Mobile Networks => choose Jio Sim =>create New Access Point. 2. Enter App as JioNet. 3. Enter proxy - 202.88.241.12 and port 80. 2. Use Jio data till 700mb. After this download 2 or 3 videos using Youtube. When during this download you reach 900mb, your download will automatically stop. 3. Now resume the app, if it will resume and you get the speed then enjoy unlimited 4g for full day. 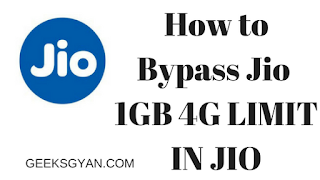 Follow, these steps and get beneficial use of the service being given by the company until next three months and keep on using the New Year service with a good speed.I hope you liked the article "How To Bypass 1GB 4G speed Limit in Jio". Don't forget to share it with your friends. Yeah i heard this news well that is ok here we knows that one day they make charges on jio sim.